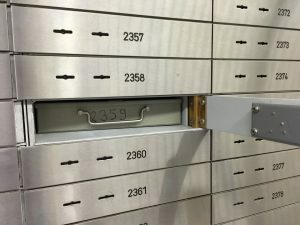 Confidentiality concerns, both on the part of owners and the institutions where safe deposit boxes are located, make this type of asset one that commonly is lost by heirs. If you know the name of the bank where the safe deposit box was held, but the branch has since moved, changed its name, or closed, don’t assume that unclaimed safe deposit box contents are lost forever. It is possible the contents were transferred to a successor institution. If you do not know where the box was held, it is still possible to find and claim its contents. Safe deposit boxes with expired leases and no further rental payments or claims eventually revert to government custody. Dormancy periods – the time during which there has been no box entry or rental payments – vary by state, but typically range from one-to-five years. To find a missing safe deposit box contact us for an appointment.